From the first days of TexasBurgerGuy.com, I have been told repeatedly that I absolutely HAD to go try out Tookie's. There were stories of people driving days on end from the far reaches of the world just for a taste of a Tookie's burger. Knowing this, I saved Tookie's to review for a few reasons. First, it is dang near the end of the earth from where I live and second, I was saving it for when I was really looking forward to a good and tasty mom and pop burger joint experience. My oh my were my expectations set sky high for this place. Probably shouldn't be a suprise that I was pretty disappointed with Tookie's. I know this probably will burst some people's bubble, but I have to give an honest assessment of Tookie's... no matter how ugly it might be. Oooze is one area that the Tookie's cheeseburger excelled. It was not a dry burger by any means but it also was not a burger that would make a cardiologist cringe with fear either. I would have say it had the right amount of oooze without going overboard. The Tookie's Cheeseburger was not a big burger. Not many herds were killed to make this thing lay down on my plate. Like I said, my expectations were very high for Tookie's. I expected to be blown away by this place but instead I was met with a pretty small, not really all the great tasting burger. Tookie's loads the burger with lettuce, tomatoes, onion, and pickles. The patty is not that thick but with the vegetables, it makes the burger a little hard to handle. I'd have to say this is a 1 hander only. The Tookie's Cheeseburger is 3.69. After consuming this burger, I still had room for the onion rings. I would have preferred though for almost 4 bucks to be stuffed with beef instead of fried onions. The Tookie's menu is one of the most creative I have seen yet. I've never seen picante sauce, refried beans, and beef combined on a burger. Nor have I heard of marinating a hamburger in wine before either. I did spot a few of these burgers being ordered around me and they looked pretty interesting. I think if I ever go back, I will have to try one of these specialty burgers as it seems to be the thing that draws people there. One of the things that I heard so much about were the onion rings. People simply RAVED about how good they were and how badly I needed to try them out. Ofcourse I complied. I must say, the were pretty good. I wouldn't say great... but they were good. I am learning that onion rings are like BBQ. Everybody has their own tastes and preferences when it comes to O-rings. To me, these were just OK... others may think differently. We were there on a holiday weekend and the place was busy busy busy. As a result, the service was just a step above what you would expect if you were to serve yourself. I'm not slamming Tookie's for this because it was a holiday weekend and they were extremely busy.. BUT gimme a break. Mrs. TBG tried the T-Bird which is the grilled chicken sandwich. She said it was good... but not great. Without question the atmosphere at Tookie's was AWESOME! This quite possibly ranks at the top of my mom and pop burger joints in terms of the building itself. The inside is wood. The ceiling is wood, the floor is wood, walls are wood, wood tables, wood everywhere. If a fire ever started in this place... look out cause it is coming down really fast. All in all though, I really enjoyed the booth we were in. It was easily the best part of the visit. From I-45 and Beltway 8 (Sam Houston Tollway), go south. Exit NASA Rd 1. Hang a left. You will stay on NASA Rd 1 until it hits Hwy 146. Take a right on Hwy 146. Tookie's will be on your left. The restuarant itself was awesome. I really loved the building and the attitude it put off. The food and service left a lot to be desired. With all the talk about Tookie's, I thought for sure I was in for a real treat. What I got was a pretty big let down. 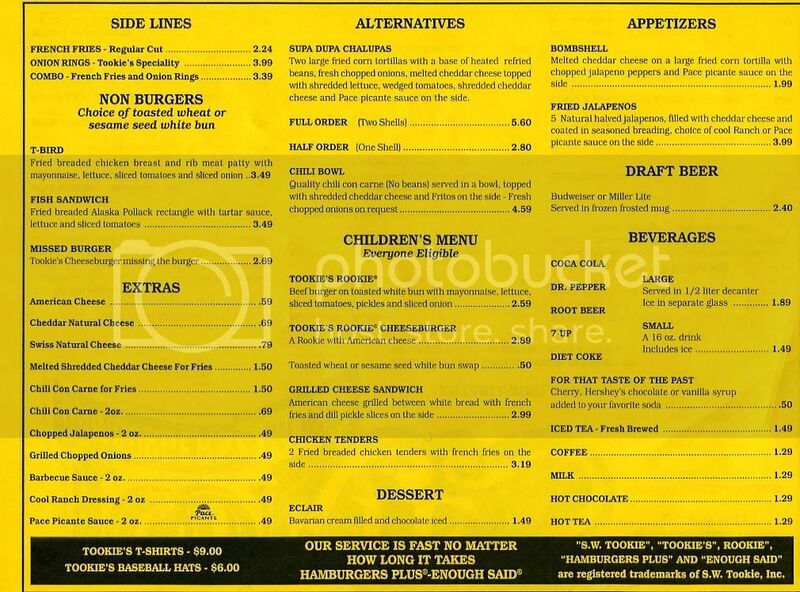 I may go back to Tookie's to try a specialty burger. That has to be what everybody is talking about. I have to agree with Tookies being sub-par. The burgers were small and the onion rings were as big as the burger....hmmm. What's wrong with this picture? I had the Stomps burger and it sucked! The menu said "very hot", but the damn thing was covered in bland grilled onions. I didn't see any jalapenos. And the picante sauce must have been mild. Anywho... Tookies used to be good...about 10 years ago. Did they change owners or management? If so...OFF WITH THEIR HEADS!!! Burgers should NEVER be served on a styrofoam plate. 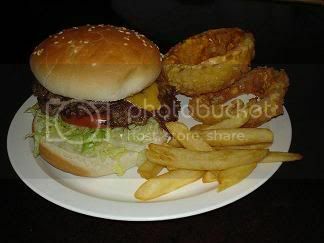 You know you are doing a burger right when you serve it in a basket with a white piece of paper lining the bottom. You should comment on this in the future! You people don't know what you're talking about. TOOKIE'S IS AWESOME! I'be been going there since the third day it was open back in the late 70's. Not much has changed since then. A #198 w/cheese and a fry/ring combo and a Cherry Coke. Can't beat it. I eat no less than 50 of these a year and have never been dissatisfied. Go back when its not crowded. I've waited 3-1/2 years to try Tookies' Squealer and that's where you screwed up -- should have gone with the Squealer. Innovative, juicy, delicous. A tad on the small size but that's ok, that left room for the Champion #99. Awesome. The squealer was better, but the champion gave it a run for its money. Great review in the Houston Press that you might want to check out. Explains why your burger didn't ooze. Yeah, it's the Squealer. I'm not from Texas, but have been on this burger quest from California to New York, and that Squealer's in my top ten. I take out-of-towners there to show that there are some bright spots in Houston. And it's unanimous, the Squealer. Word. I have never been to Tookies, but you should do a review on Cupps in Waco near the Baylor College Campus. It doesn't look like much, but dang those burgers and homemade fries are really, really good. Thanks for the service you provide - Ben O.
I am a Houston native and current resident of the Clear Lake area. I've been to Tookie's 4 times since I first discovered it in 1986. The first time with friends...not impressed. The next two times with friends who love the place...still not impressed. The last time with a girlfried to give Tookie's one last chance. Alas, I'm just not impressed! The burger is ok. 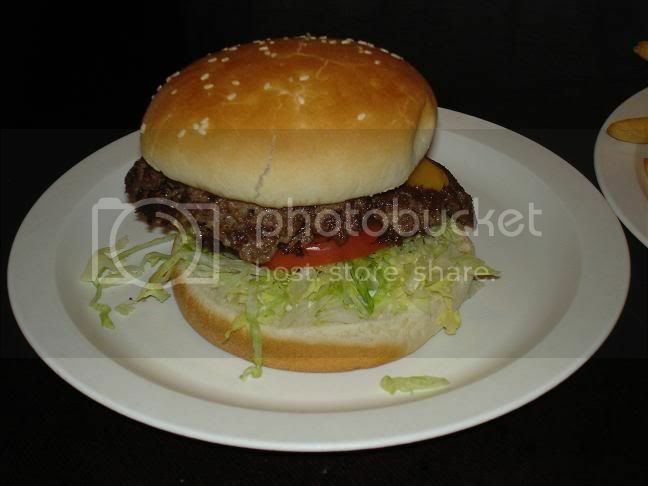 It is fresh and juicy, but the patty seemed a bit small and lacking in zest and flavor. The veggies seemed to be stacked on to compensate for a not-so-good patty. The onion rings are pretty good, one of my faves next to Fuddruckers and South Shore Beer Garden. Which brings me to an alternate for TBG. If you ever make it down this way again, please continue south on Highway 146 from Tookie's, then take a right at FM 2094 in Kemah. About 2 miles down, you will find South Shore Beer Garden, a little corner burger shack on your right. They have a juicy, flame-broiled ground chuck burger with bacon, swiss, and mushrooms that will make you do a happy dance. There you will find the old fashioned red baskets with a burger that could easily cradle in two hands. Juice fills the bottom of the basket, just as much from moisture as from grease. Now, if you want to clog your arteries, try a grilled Philly steak sandwich there at the Beer Garden while you are there. 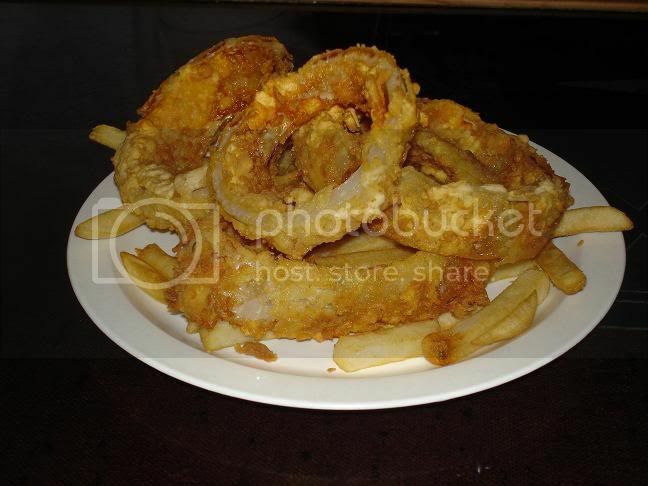 Onion rings are awesome, although the serving is a bit small. Fries are par. I think you will find that the less polished, scruffier looking South Shore Beer Garden beats Tookie's hands down! Tookies is *only* known for their specialty burgers and their giant homemade fresh onion rings. And of the specialty burgers the Squealer is the best. This is like going to a steak house and ordering a chopped steak. Thanks so much for the HONEST opinion of Tookie's! I have grown up eating at Tookie's and when it was actually a Mom & Pop shop it was FANTASTIC! Sub-par is being nice compared to what Tookie's used to be. It's a shame for a home town gal to say, but I'd rather eat at Fudruckers. You guys are nuts. I grew up in Seabrook in the 70's - going back for a reunion this weekend. I will eat a Bean Burger everyday that I am there. It is the best burger ever.. And a vanilla Coke. Fuddrucker's over Tookies? Completely absurd. You have to have a specialty burger, it makes all the difference! I'm sorry your visit was not up to your expectations. I hate it when I get things overly hyped too, but I suggest going with a double patty if you want more meat. (Doesn't even break the bank to do so.) Your other reviews pickup some double patties but here you only pick up a single. Let's show some consistency, especially if you are going to lament about a lack of meat! If you want some major ooze factor and handling try the Bean Burger. I'm more of a bacon guy, so I reach for the Squealer, not overly baconey but has a strange lure for me. Swing by again and give a specialty a try. I would have to agree with some of the other comments. Tookies is KNOWN for their specialty burger. My husband didn't like it much the first time that he went and he only got a cheeseburger, the next time I ordered a Bean Burger for him and he now LOVES it. I grew up and still live in a TINY town called Anahuac on the other side of the bay from Seabrook. We drive our boat to Kemah when we go. TOOKIES is one of my favorite places to go...I suggest coming back and trying the Bean Burger!! Tookies is AMAZING! 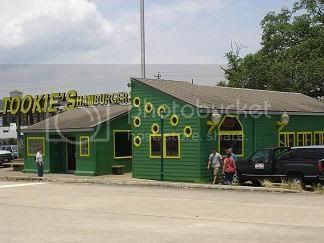 A great family atmosphere less than 5 minutes from the Kemah Boardwalk - with amazing, and extremely greasy hamburgers. My favorite is a Piggy Back - This is a double meat cheeseburger that actually has the bacon cooked into the patty. Absolutely amazing. My favorite burger in the area. Hands down the best burgers this side of the Mississipi river,awesome taste and flavor.My favorite burger spot all time. If you ever go to Tookies, you must try the #99 (or the #198 which is the double patty version). None of their other burgers are anything like it. The Squealer is great as well, but the #99 is what keeps bringing me back. Don't judge Tookies by their regular hamurgers, that's not where they shine. I have never had a regular burger at Tookie's- only the specialty burgers, and I have never been disappointed. The bean burger is very good, the chili burger is tasty, the Stomp's Ice House Burger I had once and it was packed with stuff- jalapenos, picante, cheese, everything. My favorite is that Squearler, though- yum. I'm sorry you had a mediocre experience there- the service is usually good, but yeah, when they're busy, they get a little impersonal. Overall, the specialty burgers are what you'd go there for, and when it isn't busy, the service is very friendly. Give it another try sometime. You buy a cheeseburger and then right a rewiew. They probably sell one of those a day. If going the safe route, you should have went with the DBL Meat - DBL Cheeseburger. If you didn't try the Squealer, #99, bean burger, it's your loss and not Tookie's. Appreciate the honest opinion. I went there not too long ago. It was my second time. I really feel like they nickel and dime you there. The burgers ARE small and pricey considering you dont get ANY sides. The sides are expensive, we ordered a app. combo plate and got maybe 20 fries and 4 onion rings for like $4. You do not get refils on the drinks, and you had best get the caraffe because it is the most economic. The particular waitress we had this past time was very caustic and abrasive with her humor. I can appreciate that, but some people cannot. I had the Squealer, which was very good, bt again small. There were 2 adults and 2 children and a $40 dollar bill later we were still hungry. I could have gone down the street to Sonic and felt more satisfied. Mr Burgerguy...go to Tornado Burger in Stafford and sample the spicyburger for around $2. Try a cheesesteak for $4.75. I dont know where you live, but Tornado Burger is the inexpensive place where Houston's burger pilgrims go. There's a lot to this review that I have to agree with. Tookie's prices are a little on the high side. Service is hit-or-miss. While people rave about their onion rings, I find them simply "good". And the environment is very unique - something I rather enjoy. I go there once in awhile. I'll order a carafe of cherry Coke and a #99 (the mentioned marinated burger). I have to admit - I've never had any other burger offering there. And that's simply because it is so good - why bother with anything else? This burger is a unique offering and worth coming back for despite any short-comings that are overlooked in this local institution. (And if Tookie's isn't your thing - another good local burger choice is Miller's Cafe. Another local institution. And maybe more in line with tastes that aren't inclined to bend to Tookie's direction). What makes Tookie’s great is their specialty burgers. The Stomps Ice House, the Squeeler, and the 99 all are unique and delicious. My favorite is the Bean Burger with a nice size quality burger served with refried beans, Fritos, picante sauce and cheese. What a combination! I can’t argue with you about the cheeseburgers. I don’t know and I doubt that any of the ‘regulars’ know either. The Burger House, Millers, & Fuddruckers are around for great regular burgers. Tookie’s is all about their specialties. You blew it! You should have tried the Bean Burger - tastiest burger anywhere...bar none (and I've traveled all over this country!). BTW - second best burgers in US: at Burgers and Beer in El Centro, CA.! 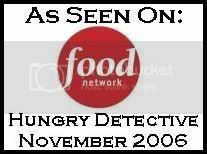 I sure hope they reopen, and if they do I hope to hell they change their fries. I worked the evening shift at the local power company right around the corner from Tookie's and I was sent out to get the grub for the crew. I came back with 3 bags of burgers, fries and onion rings. I pulled the food out of the bag and passed it around. When I pulled the napkins out of the bag I noticed a stain on the top napkin. It was a freakin' cockroach trail! That's not the worst part either. There was a damn cockroach IN THE BOTTOM OF THE BAG. Needless to say, I have never stepped foot in the place since then. After this fiasco I started getting our/my burgers from South Shore beer garden. The burgers are as good as Tookie's and they don't serve roaches. I had the wine marinated burger as a teenager...thirty years later & I'm still craving it. Best burger I ever had! Tookie's is by FAR the best burger joint ever. I lived in Clear Lake City for 12 years (1974-1987) and it was a regular place to go for good burgers, especially #99...my mouth still waters when I think about how good those are. I'm in Colorado, wishing I could be sitting at Tookie's today scarfing down a #99 w/onion rings and cherry coke! That's Heaven! here's some tips next time. get a local to show you how to proberply eat at tookies. first of all, you have to order the bombshell for an appatiser. then a coke or dr. pepper to drink, and you must get the specialty burger, not a plain cheese burger..of course its gonna be plain!..all with a side of half rings and half fries. that was your biggest mistake.and they dont serve styrofoam plates the picture just looks like that. try again. Tookies is closed and will not reopen. The victim of 1. DOT widening Hwy 146 and 2. Hurricane Ike. The storm really hammered that side of the bay. No sense in fixing it up if the highway department is going to condemn it anyway. Great place. I miss it. Every business has its ups and downs but i have been going there for years and years and there is only 2 times out of the hundreds of times i have gone, were a problem. this place is really good. its not expensive and 9 times out of 10 there food is worth every penny. i personally think that the bad reviews on here are just people out to lie and mess something up that didn't need to be messed up. this isn't a perfect word so you are going to have good guys and bad guys. i have lived here in Seabrook for over 12 years and i have say that this is a great restaurant for anybody and everybody. I don't know what it's like now, but back in the day (early 80's), this was, hands-down, the world's best burger joint. I've lived on both coasts and a few places in between and have yet to find the match of Tookie's double mean bean burger. Serously out of this world. I think you made the right choice TBG. 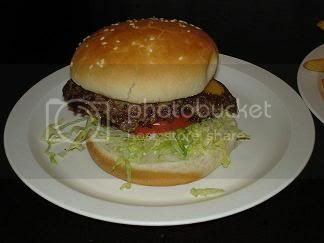 If you have to have a specialty burger for it to be good, well, it doesn't really stand out as a great burger does it? Kinda like if you have to drown BBQ in sauce, it's really not good BBQ. oh my goodness, i love love looooove tookies! you are CRAZY! i've eaten at tookies since before i can remember! Before it was tookies, my aunt and grandma worked there, my parents went on dates there! Now we live in Dallas, but we have family in houston and everytime we go visit we always eat at tookies! sosososoooo good mmm! Um, Uh, like, Um, Tookies has been closed since the earthquake. Oh sorry, maybe that was In-n-Out. Since hurricane Ike. The storm so bad my mail box fell over. 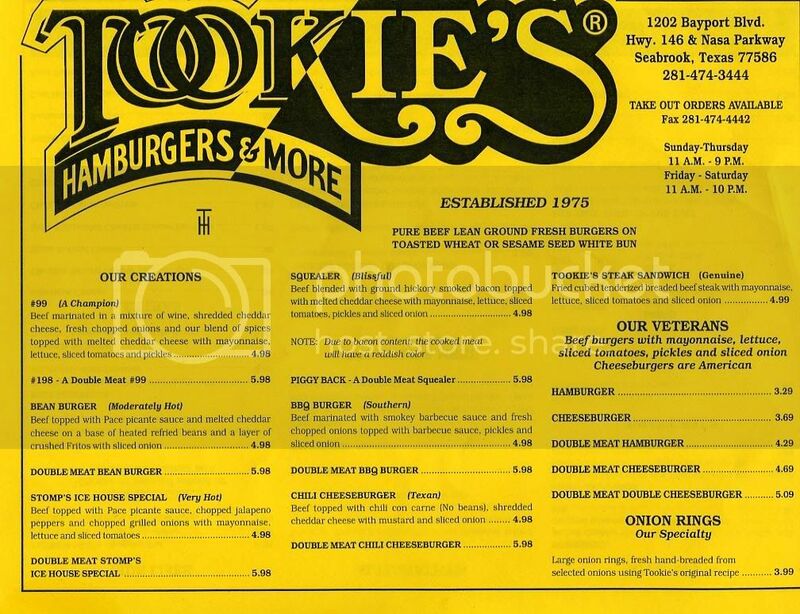 If tookie's burgers are the same since I was 12 years old then I am saying I still think and crave Tookies burgers!!!! Tookie's is coming back! It should be open around July. Check their facebook page for updates. Its the bean burger, simply great. My family have been going there for atleast 30 years, when we are in the area. My husbands favorite place. Tookies has always sucked, people that rave about it are just holding onto their past way too hard. I grew up in League City and have eaten my fair share...was rarely impressed. I only go back to relive my youth. There are far better places/greasepits in the area to gorge yourself. NEW and IMPROVED TOOKIES! Since we re-opened in late 2011, we have to offer half pound burgers and you can double your heart burn with a double. Which is a pound, the o-rings are still the number one seller, hand battered and as big as your face. Squealer burger what can beat ground up bacon in a never frozen hand made patty? Maybe if you put it on a bean burger that's my favorite. All you doubters give it another chance, remodeled and new staff sure to love your next experience at tookies. P.S. I work there ask for Sarah! What year did Tookies open? does anyone remember? I'm a HUGE fan of pre-Ike Tookie’s and it used to be one of our favorite restaurants but must say that on my last visit the Service was inattentive! And unfriendly. I ordered I simple BLT with very crisp bacon and mustard instead of mayonnaise after waiting 20 minutes I moved from the Bar to a table and was served my French fries with a uncooked bacon sandwich which the manager brought to me. I pointed it out and he said he will get it right so after waiting another 15 minutes a very young waitress came up and she had the nerve to give me my bill BEFORE I had my food!!! She took the bill back and never asking anyone about my food! !So I again asked the server were my food was and she asked the bartender who took the original order. Now here's the interesting part after waiting almost 50 minutes I found the manager who was running around like a chicken with his head cut-off to tell him to cancel my order he said oh they did not correct it? No I didn't eat anything and left hungry.